In 2009, the U.S. Geological Survey in cooperation with the U.S. Department of Energy’s Naval Reactors Laboratory Field Office, Idaho Branch Office cored and completed well NRF-16 for monitoring the eastern Snake River Plain (SRP) aquifer. The borehole was initially cored to a depth of 425 feet below land surface and water samples and geophysical data were collected and analyzed to determine if well NRF-16 would meet criteria requested by Naval Reactors Facility (NRF) for a new upgradient well. Final construction continued after initial water samples and geophysical data indicated that NRF-16 would produce chemical concentrations representative of upgradient aquifer water not influenced by NRF facility disposal, and that the well was capable of producing sustainable discharge for ongoing monitoring. The borehole was reamed and constructed as a Comprehensive Environmental Response Compensation and Liability Act monitoring well complete with screen and dedicated pump. Geophysical and borehole video logs were collected after coring and final completion of the monitoring well. Geophysical logs were examined in conjunction with the borehole core to identify primary flow paths for groundwater, which are believed to occur in the intervals of fractured and vesicular basalt and to describe borehole lithology in detail. Geophysical data also were examined to look for evidence of perched water and the extent of the annular seal after cement grouting the casing in place. Borehole videos were collected to confirm that no perched water was present and to examine the borehole before and after setting the screen in well NRF-16. of 4.4 × 102 to 5.1 × 105 ft2/d. Water samples were analyzed for metals, nutrients, total organic carbon, volatile organic compounds, semi-volatile organic compounds, herbicides, pesticides, polychlorinated biphenols, and radionuclides. All chloride, nitrate, and sulfate concentrations were less than background concentrations for the eastern SRP aquifer north of the NRF. Concentrations in water samples for most of the organic compounds and radionuclides were less than the reporting limits and reporting levels. 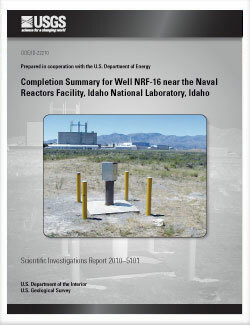 Twining, B.V., Fisher, J.C., and Bartholomay, R.C., 2010, Completion summary for well NRF-16 near the Naval Reactors Facility, Idaho National Laboratory, Idaho: U.S. Geological Survey Scientific Investigations Report 2010-5101, 36 p.